Hillary Clinton and Bernie Sanders were locked in a race for the Iowa caucuses that was too close to project, with 96 percent of precincts reporting Monday night. The candidates were separated by less than 1 percent. Hillary Clinton led in delegates 27-2 with only two outstanding. Early Tuesday morning, the Sanders campaign alleged that the Iowa Democratic Party "failed to adequately staff all the precincts," an aide said. "The campaign is very concerned there is now no way to verify the accuracy of the results in these precincts that are not reporting," the aide added. But the party insisted those claims were inaccurate. "We have reached out to the campaigns for help in contacting the chairs for our outstanding precincts," a party official said. "We are not taking results from the campaigns. We are taking them from the chairs who are in these precincts." "There is so much at stake in this election, I don't need to tell you," Clinton said tonight. "Every single one of you who came out for me, who worked so many hours from my young organizers with energy and passion, to the families and friends across this state, I am deeply grateful." 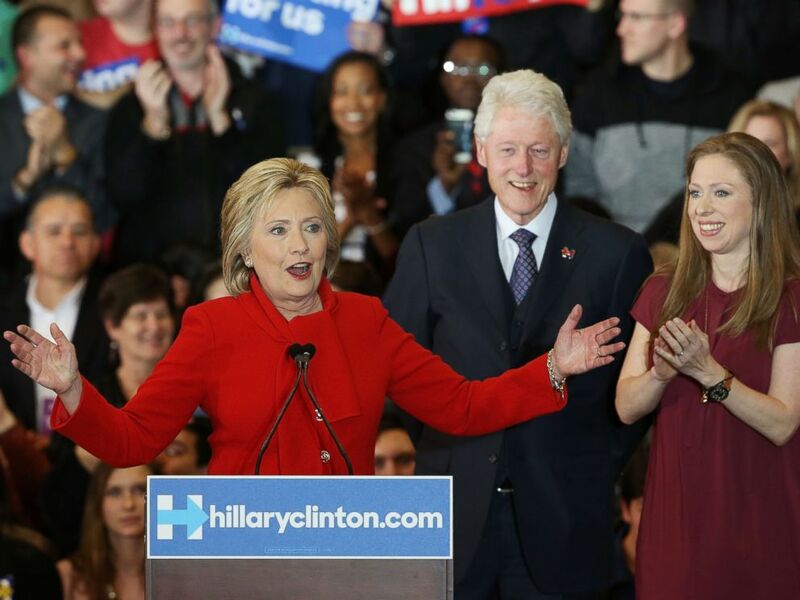 Democratic presidential candidate Hillary Clinton speaks to supporters as former President Bill Clinton and daughter Chelsea Clinton look on during her caucus night event in the Olmsted Center at Drake University, Feb. 1, 2016 in Des Moines, Iowa. "As I stand here tonight, breathing a big sigh of relief, thank you, Iowa," Clinton said. "I want you to know, I will keep doing what I have done my entire life. I will keep standing up for you. I will keep fighting for you." Clinton said she wishes Martin O'Malley -- who suspended his campaign tonight -- the "very best," and said she is "excited about really getting into the debate with Senator Sanders about the best way forward to fight for us and America." Sanders also greeted a crowd of enthusiastic supporters. 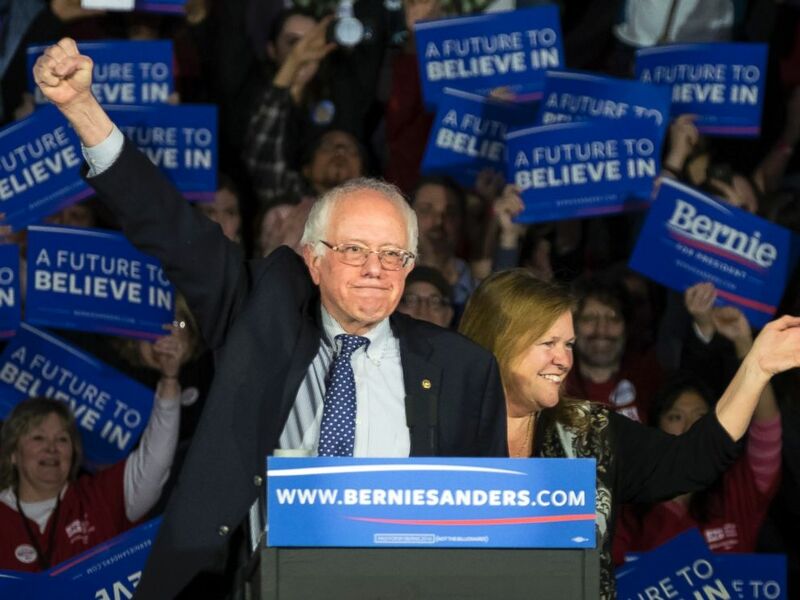 Democratic presidential candidate, Sen. Bernie Sanders, and his wife Jane acknowledge the crowd as he arrives for his caucus night rally in Des Moines, Iowa, Feb. 2, 2016. "Nine months ago we came to this beautiful state," he said. "We had no political organization, we had no money, we had no name recognition. And we were taking on the most powerful political organization in the United States of America. "And tonight while the results are still not known, it looks like we are in a virtual tie," Sanders said. Sanders also thanked O'Malley, saying that he "contributed a whole lot to the dialogue, that he ran an issue oriented campaign, and he won the respect of the American people." Earlier today, Clinton acknowledged the race in Iowa was “tight” in an appearance on “Good Morning America,” but said she was optimistic. Women, moderates, mainline Democrats and fans of President Obama’s policies were boosting Clinton in the Iowa caucuses. Clinton does best with early deciders, and there appear to be more of them than usual. Sanders counters with very liberal caucus-goers, independents, young people and first-time participants, according to preliminary exit poll results measuring initial preferences. In the final poll ahead of the caucuses, released over the weekend, Clinton and Sanders were in a dead heat. The Des Moines Register-Bloomberg News poll showed Clinton at 45 percent compared to 42 percent for Sanders. Sanders narrowed the former secretary of state’s national lead less than two weeks before the caucuses. The next test will be in New Hampshire, the nation’s second nominating contest. There, Sanders leads Clinton by a wide margin, 57 to 34 percent in a CNN-WMUR poll released on Sunday.